Construct a OOAK ring band with bezel setting! Special Ring band, Bezel & Prong setting Workshop. Or make a pendant! Thursday evening’s starting January 3rd in the new Queen street west location! during Open Studio time 906 Queen Street West at Crawford street! Learn how to measure, fabricate and form ring bands, bezel/prong set cabochon stones, saw, and solder. Texture your metal designs using hammers, stamping tools, or by fusing/soldering cut-out shapes, small balls, metal shavings, etc., onto the band. Learn what annealing is and work hardening your metal. Students leave with beautiful, handmade, OOAK creations and the knowledge/skills to build more work! A resource list of suppliers is included. Reserve your seat(s) soon! fine silver bezel wire for a cabochon cut stone. wire for prong-like settings or to use to as a bail for a pendant. Dia De Los Muertos Sugar Skull Making Workshops! Everyone is welcome to join the fun! Learn how to make and decorate Mexican sugar skulls. Learn about Dia de los Muertos festivities and the Ofrenda. How to construct sugar skulls and animals will be demonstrated. Adding foils, paper flowers & icing flowers will be demonstrated. Participants will then decorate their sugar skulls using Royal icing, metallic foils and more! Fun for the whole family! Workshops start at 12pm Saturday and Sunday. Green chile/corn tamales, tacos, chips & various salsas, churros, horchata and more (so, don’t eat lunch beforehand!) * children 12 & under must be accompanied by an adult. Everyone can participate and put something either traditional or symbolic on the altar. The altar is where people can express their feelings for those loved ones being honoured. Americans (and non-Catholics) are beginning to adopt this tradition and now altars are becoming popular in private homes as well as in public places. In Mexico, the traditional family altar explodes with colour during Day of the Dead when many special items are set out as offerings to the returning spirits. The entire family will work together in the decoration; similar to families who decorate their Christmas tree together. Many families spend up to two month’s earnings on the food & decorations for their ofrendas. Now celebrated in countries around the world, Dia de los Muertos, or “Day of the Dead,” is a two-day holiday which originated in Mexico to remember deceased loved ones. It’s a Mexican national holiday and the country’s largest celebration of the year, but Dia de los Muertos extends well beyond to Guatemala, Brazil, Spain and Mexican-American communities in the United States. The observance is Nov. 1 and 2, coinciding with the Catholic All Saints’ Day and All Souls’ Day. Typically, the two-day celebration is divided into separate days to honor deceased youth, Dia de los Inocentes (Day of the Innocents) or Dia de los Angelitos (Day of the Little Angels) on Nov. 1, and adults for Dia de los Muertos on Nov. 2. In some beliefs, it is a three-day holiday beginning on Oct. 31, All Hallows Eve, when some believe the souls of young children arise at midnight. Not to be confused with Halloween, this holiday has a rich history and involves more than dressing up in costumes or trick-or-treating. On Dia de los Muertos, families gather to celebrate those who have died as well as build altars in their homes, schools or other public places to pay homage to the deceased. Many honor the dead with gifts of sugar skulls, chocolate, marigolds (the Mexican flower of death), sweetbreads and trinkets. Families also typically visit graves to deliver the ofrendas, or “offerings,” and hold vigils with candles and photos. Dia de los Muertos can be traced back to the Aztecs who celebrated with a festival for the goddess of the underworld, Mictecacihuatl, and the Catholic Spanish conquistadors’ All Saints’ and All Souls’ days. Scholars have noted the indigenous cultures of Mexico honor the Lady of the Dead, the modern La Catrina, which many recognize today as a skeleton woman wearing a fancy hat. Glass Kiln forming workshop Nov 3, 4 & 5, 11th or Monday afternoons noon-5pm Oct 16th-Nov 6th & November 13-Dec 4th $300pp+(optional) lab fee This intensive class introduces fundamental concepts of creating glass objects in the kiln either through lost wax casting, Pate de Verre or a combination of the two. 1st Friday evening overview demonstrates the Vitrigraph kiln/flameworking cane/murrine. Students will learn kiln forming towards making window pieces, bowls/plates, sculptural, wearable items and more! Students work with Bullseye glass, frit/powder, rod and stringer OR have the option (casting only) with gorgeous Gaffer crystal. No experience with glass is required for this course. Friday evening 6:30-9:30pm: Introduction/demonstration of vitrigraph kiln and flame working cane/murrini for use in kiln forming glass. Saturday afternoon (noon to 6pm): Students have the opportunity of hand pulling cane/murrini at the torch. Students build models from clay, wax patterns, moulds using alginate and more, set-up the kiln for kiln forming/casting/pate de verre. Sunday afternoon (noon-5pm): Students learn how to work with refractory materials to hand-build moulds, mother moulds, weigh for glass. Models are steamed out of moulds and set-up in the kiln(s). Saturday afternoon (noon to 5pm): Students return to de-invest their models, cold work their glass by hand. Students are emailed concerning glass colour choice, otherwise everyone works with clear glass. Please leave your start-up date choice in a note when registering or email the studio. Flame ON!, Next workshop starts Tuesday evenings Nov 14th 6:30-9:30pm $130pp includes materials- Class runs 3 evenings. No experience necessary! Ages 12 on up are welcome! Oct-November Lost wax casting metal or glass. Kiln-forming glass. Ring band & Flame-working classes & more! Glass Kiln forming workshop Nov 3, 4 & 5, 11th $300pp+(optional) lab fee This intensive class introduces fundamental concepts of creating glass objects in the kiln either through lost wax casting, Pate de Verre or a combination of the two. 1st Friday evening overview demonstrates the Vitrigraph kiln/flameworking cane/murrine. Students will learn kiln forming towards making window pieces, bowls/plates, sculptural, wearable items and more! Students work with Bullseye glass, frit/powder, rod and stringer OR have the option (casting only) with gorgeous Gaffer crystal. No experience with glass is required for this course. Learn how to form, fabricate, solder, set-stones and more in our 4 wk Metal + Glass course. Metal + Glass courses are offered afternoons and evenings Monday & Wednesday. Ring band & Wedding band workshops, Lost wax casting silver, alloys, etc. Please see below for our current schedule. evening #3: Working with wax create pieces w/the lost wax technique- to be cast in Sterling silver or bronze/brass. Glass powders/Frit & sheet for Fusing *Approximately 1kg of Lead crystal towards a lost wax casting. Monday October 2nd or Nov 6th 6:30-9:30pm (deposit of $137.50 to reserve seat) Please leave a Paypal note concerning the start date you prefer, or email the studio. In this course students carve/sculpt jeweller’s wax making a ring or a pendant that will be cast in Sterling silver and/or bronze. Burn out casting will be discussed, and low-tech casting methods will be discussed and demonstrated. Students will learn how to make moulds for wax injection/production work. Casting stones in place, such as: diamonds, sapphires, meteorites and certain lab grown stones will be discussed/demonstrated. The first evening starts with an introduction to various jeweller’s wax, carving tools, subtractive and additive sculpting. Students then discuss their design ideas and begin to carve/sculpt their pieces to be cast. The second evening discusses how to cast organic materials; bone, shell, or wood. Each evening covers a different part of the Lost Wax process into finishing work to a high polish or brushed finish as well as working with patinas. *students wishing to cast in gold will be given supplier information. Casting organic materials will be discussed. Some items may be ‘burnt out’ within a casting flask, while others require moulds to be made. Casting various stones in place is discussed and some stones will be available for students to experiment with. Learn how to properly measure your finger(s), layout your pattern and hand cut, form, forge a sterling silver ring band! Demonstrations on adding textures via hammers, stamping tools, and Rolling Mill add inspiration. 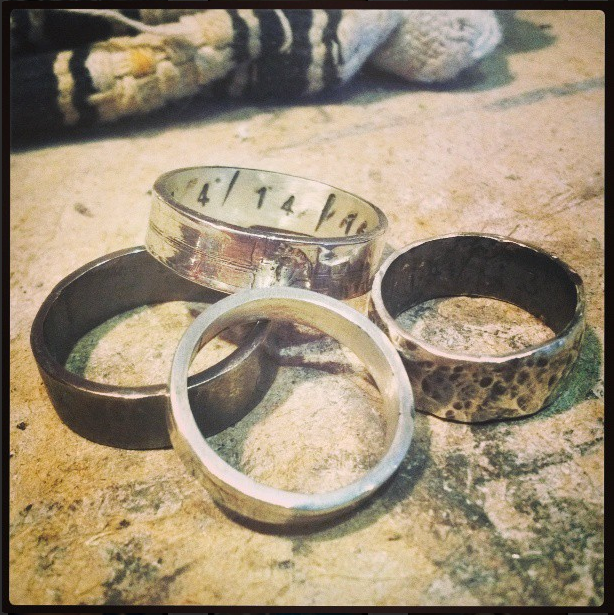 Finishing techniques; brush, satin, rustic and high mirror polish and leave the workshop with a beautiful sterling silver ring or set of 3 thin stacking rings*! Participants learn how to hand saw, add texture, form, solder and finish their rings in this super fun workshop! All materials included. Sterling silver for 1 wide band ring or sterling silver for 3 stacking rings, or a combination of sterling copper and bronze for stacking rings. Space is limited, registration is 1st come, 1st served. Please leave a note at checkout with your preferred date option, May 20 or May 27. Wedding band workshops vary upon approach, materials used, etc. Generally the wedding band workshops are private bookings. Wedding band workshop wax & DIY cast in the studio! $600pc+metal. If you and your fiance are looking to create non-traditional rings, I recommend the lost wax process for couples with no experience. Lost wax involves: carving (for hard wax), sculpting, and/or filing wax ring blanks (or form ring blanks from soft wax using your fingers). These models are then cast in either Gold, Sterling or Bronze. Before they are cast we weigh the wax and determine cost, if the waxes need to be adjusted to fit budget, etc., we adjust the rings at this wax stage. Wax is also more forgiving and if you make a mistake, etc., you can easily start over or fix the model. Working straight from gold stock is not the same, can be considerably more expensive, and there isn’t a lot of room for error, plus solder needs to be purchased as well, see www.imperialproducts.com for quotes. They are located in Markham, ON. White gold comes in 10k, 14k, 18k, 19k the higher the karat the more gold, lower means more alloy to make it appear ‘white’, same applies with red gold, or green gold. Wedding set. 18k white gold with blue and white diamonds. 1st session involves working with your designs and creating them out of wax. I show you different approaches to working with wax, various jeweller’s wax, tools and equipment used, carving using hand tools, and rotary tools, etc. Rings are created. 2nd session – If you opt to cast the rings yourself/in house*. We go through the process of Spruing your wax ring models and investing them. The mould is then cured and …. 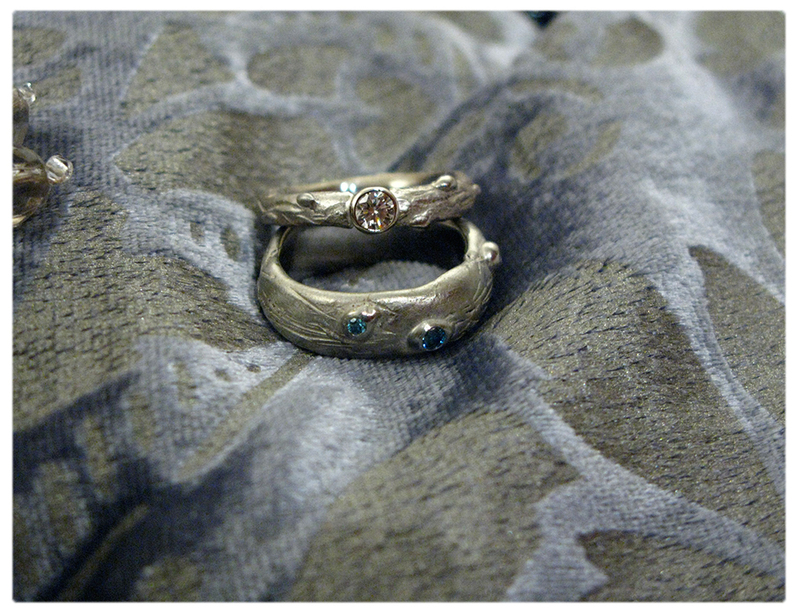 3rd session: Metal has been purchased and your rings are invested and ready to cast! We go through the entire process of centrifugal casting on this day then, go over various finishing techniques, filing, sanding, polishing. The Wedding band (wax) workshop runs= $300 per couple + metal for approx 9hrs does not include stone setting** Deposit of half to book time. metal costs are based upon the spot price of the day- I do not charge any extra for gold unless shipping is involved. Basically, you are paying less than wholesale for your custom rings. Gold rings in past wax carving workshops have run $250 to $650 per ring for 14k. $400 to $850 per ring for 18k. Lost wax cast Sterling silver rings are considerably less, $30 to $110 depending on size. How much metal would you need (gram wise) is completely dependant on size of ring & your Sprue. A rough idea: approximate gram weight for an 8.5 to size 9 ring would weigh 9 to 10 grams and cost (if purchased through a metal supplier) around $460 to $500 (for 18k rectangular wire same dimensions as Sterling mentioned above) plus solder (18k medium grade) which could run $85 to $100+ for a coupon. That said, adding a small amount of high karat yellow gold to sterling is also an option (fused and/or soldered to the Sterling). The beauty of adding high karat gold to Sterling is the bi-metal look plus you could add a patina using Liver of Sulfur that would make the Sterling appear black and the gold pop. Here is a link to my friend’s website (artist/metalsmith Vina Rust) demonstrating LOS on sterling w/gold. Another option, though completely different would be to work with iron nails and add gold to that. 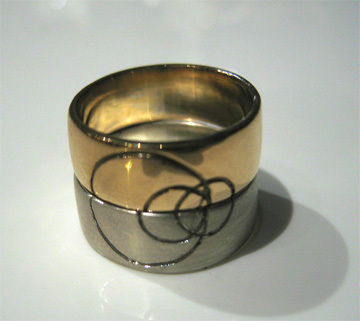 Wedding band workshop-fabricate (melt your own gold (generally equalling more than 10 grams worth), work w/alternative materials, etc) $350per couple (pc)+ BYOM 6hrs. The difference between this workshop and the wax? This workshop YOU bring in your metal strip or enough high karat yellow gold to melt down and roll out into strips that are then cut, filed, sanded, formed, soldered, etc. Similar to our Sterling ring band workshops in method, yet you supply the raw materials. Generally available- Tuesday, Thursday and Friday evenings and Sunday afternoons. Please email me to discuss your ring ideas! ** Cast in place! For entirely one-of-a-kind rings consider casting raw diamonds into the ring, or meteorites/tektites, iron. Another idea: cast two different metals! March Break 13-17, 2017 Taster workshops! Flame-work molten glass & Metal + Glass Camp! Glass Pate de Verre workshop Friday afternoon, July 15th 1pm-4pm $130pp This 3-hour class introduces many fundamental concepts of creating glass objects in the kiln. After a brief overview, students make a small bowl or ‘Sugar’ Skull using granules of glass that are mixed to form a paste. Colour is applied selectively by sifting or painting on glass powders. Pâte de verre is a kilncasting method that literally means “paste of glass”. The general premise is to mix frit granules with some sort of binder such as gum arabic, then apply the glass to the inner surface of a negative mood. Nanopod provides students with a plaster silica mold of a bowl or skull and demonstrates pâte de verre methods and design options. You personalize the project using a palette of glass powders and fill the shell of the mold with a frit paste. Your piece will the be kiln-dried and back-filled prior to firing. The final piece, which will be available for pick-up a few days after class, will be a hollow form that, despite its delicate and sugary appearance, is a strong and long lasting object. Bowls are approximately 4 inches in diameter and 2 inches high. No experience necessary, materials included! This workshop introduces students to the basics of mandrel-wound glass beadmaking by the process of flameworking (lampworking) shaping glass at a bench-mounted, surface-mix oxygen/propane torch. Safety is discussed, tools, terminology of glass, and process. Each student will have access to a torch and will melt and form glass using a variety of hand tools. No experience necessary! Ages 14 on up are welcome! Day 1: Working with hammers and stamping tools students add textures, words, images to copper pendants, and small bracelets. Day 3: Small field trip to the near-by park to collect blades of grass, twigs, leaves-back at the studio observe your specimen under a microscope and replicate your findings in glass! Paint on glass, make a couple of pendants and a window piece. Students will learn kiln forming/carving and make 5″x7″ window pieces and a couple of pendants. Recommended for 12 years on up! Under 18? Parental consent forms are sent via email upon registration. Super course rate of $50 per day – Reserve your space today!